Much has been written about the have-nots in domestic litigation and domestic arbitration, with an apparent assumption that their fate was mainly a domestic affair. In recent years, however, internet commerce has brought consumers to the international market, an increasingly globalized workforce has generated a class of international employees, and the link between international trade and human rights has revealed a host of victims. The arrival of these 'have-nots' in international arbitration means that previously latent questions about international arbitration's integrity as a system and role as a mechanism for transnational regulatory governance have been brought to the fore. Using experiences in the domestic and the investment arbitration contexts as a backdrop for comparison, I examine the treatment of have-nots in international arbitration. In domestic and investment arbitration, claims by have-nots have revealed and exacerbated structural weaknesses in those systems, and have produced unanticipated shifts in power from sovereign governments to private arbitrators. In contrast to these experiences, before these new parties are fully integrated in international arbitration, the international arbitration system has an opportunity to engage in deliberative construction in order to ensure that the system is prepared to facilitate fair adjudication of their claims and to effectively mediate the competing regulatory interests that will be implicated. 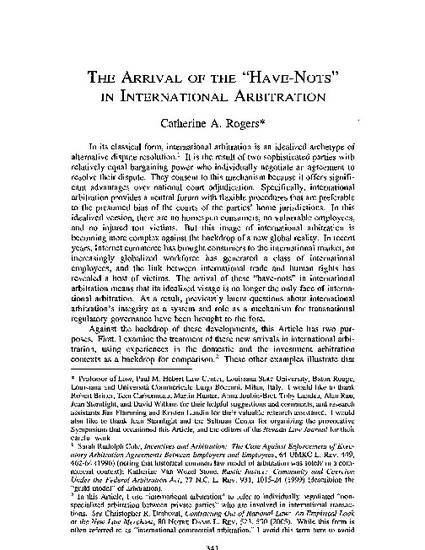 The structural features of the international arbitration system and the professional ethos of its caretakers endow it with a demonstrated capacity to facilitate international governance and promote (not undermine) transnational regulatory interests. To fully realize these goals with respect to claims involving have-nots, however, and even more importantly to avoid the pitfalls encountered in domestic and investment arbitration, I conclude that the international arbitration community must necessarily undertake active efforts to accommodate these new types of claims by, among other things, training arbitrators and developing specialized procedures specifically adapted to these new types of claims.